Backstage at Zang Toi Fall/Winter 2016 at New York Fashion Week, Lead Stylist for Macadamia Professional, Eiji Yamane created The Courchevel Chignon for the show. 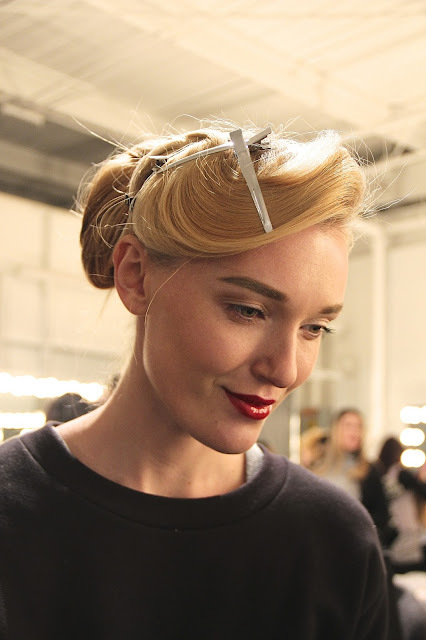 This hairstyle features a classic Hollywood glamour in the front with loose chignons in the back. 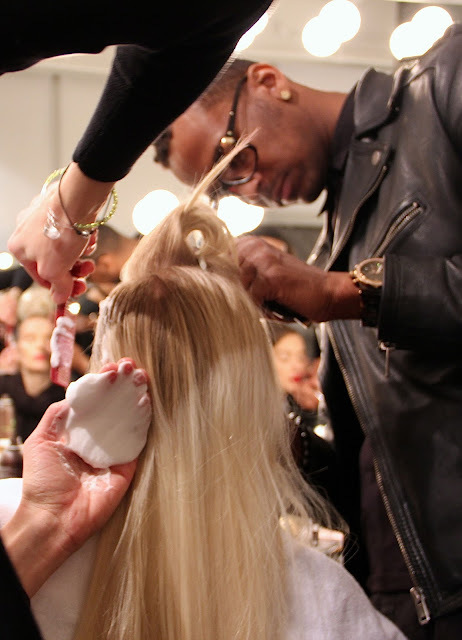 Learn more about The Courchevel Chignon as the Macadamia Professional team takes us through hair prep. 2. Part hair over the right eye and curl front left section of hair with a large curling iron to create loose waves. Spray with Macadamia Professional Style Lock Strong Hold Hairspray and pin back taking care not to cause a crimp or mark with your pin. Run curling iron through the right side creating slight bend and clip back. 3. 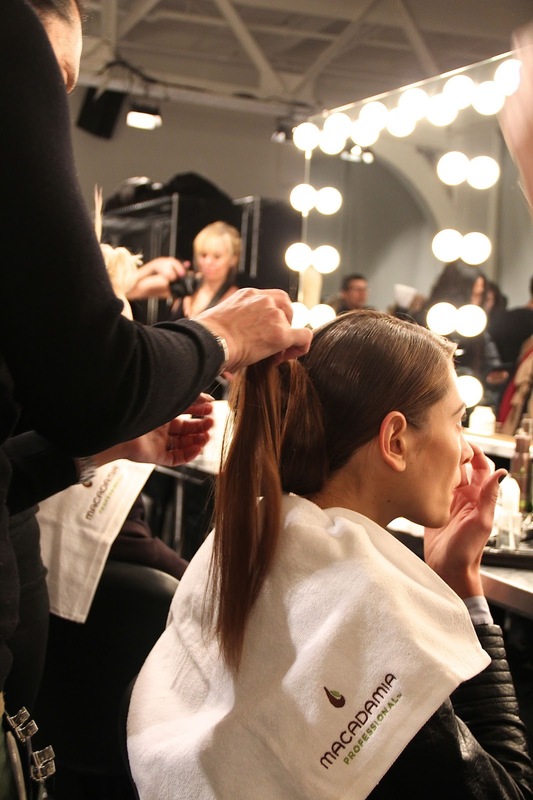 Take remaining hair and pull back into a low ponytail at the nape of the neck. Using a curling iron, curl the entire section at once to give slight softness and movement. 4. Separate ponytail into three sections. Take the left section and curling up; create a large loop, hiding the ends inside the newly defined bun. Secure with bobby pins and spray with Macadamia Professional Style Lock Strong Hold Hairspray to lock in place. 5. Repeat step 4 with the middle and right sections of the ponytail to create a triple chignon. 6. Remove clips from the front right section and loosely pull hair back along the side of the head, creating a light wave above the ear. 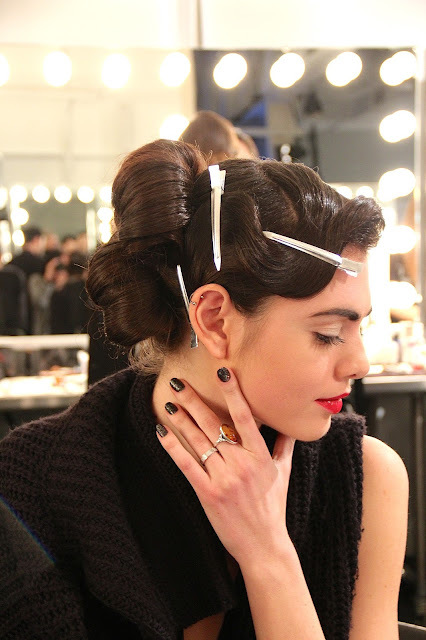 Tuck the ends behind the chignon and secure in place with pins. Spray with Macadamia Professional Style Lock Strong Hold Hairspray. 7. While holding hair in place with your hand, remove clips from the front left section and create dramatic waves cascading along the side of the head. Spray with Macadamia Professional Style Lock Strong Hold Hairspray hold waves in place and then tuck the ends behind the chignon and secure in place with pins. 8. To complete the look, liberally spray Macadamia Professional Weightless Moisture Dry Oil Micro Mist for added shine and luster. 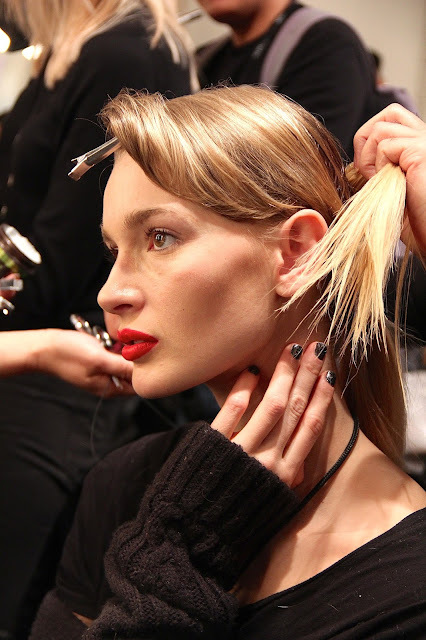 Beautybyrudy for Ubati created the makeup look for the show, featuring a Courchevel Chic lipstick by Ubati for a bold red lip. Zoya Nail Polish created the nail look for the show, prepping the manicure with Naked Base, two coats of Imogen and Naked Manicure Glossy Seal for a high-shine finish.